Whether they’re sledding, skating on a frozen pond, building a snowman, or catching snowflakes on their tongues, kids love to play in the snow during the winter. Although playing in the snow can be a ton of fun, it can also be risky. Here’s a quick guide to keeping kids safe while they’re enjoying a winter wonderland. As the first medical professionals that your kids will see at the hospital, nurses have a lot of experience dealing with cold-weather injuries. They’ll tell you that kids are at far greater risk for frostbite than adults. If you notice that their skin has turned red, tingly, or numb from the cold, take them inside and soak their cold skin in lukewarm water until the feeling returns. If their skin turns white or grayish-white, you should take them to the hospital immediately. Another serious cold-weather problem, according to Kim Ens, a registered nurse who directs Clinic Services for the Lawrence County Health Department, is hypothermia. Infants are especially vulnerable to hypothermia because they don’t create enough of their own body heat to ward off freezing temperatures. Ens and others who graduate from nursing school recommend that children wear long underwear and multiple layers of clothing, in addition to coats, scarves, hats, and mittens, when playing in the snow. Because wet clothing pulls heat away from the body, they recommend peeling off outer layers of wet clothing and giving kids dry mittens to carry in their pockets. Everyone loves the thrill of riding a speeding sled down a snowy slope. However, the thrill isn’t always worth it; emergency rooms treat as many as 160,000 sledding injuries every year. Most sledding injuries happen in the runouts at the bottom of the hill. Fortunately, with some simple precautions, kids can enjoy the ride without ending up in an ambulance. · Wear a helmet. Children under 12 have heads that aren’t quite proportionate to the size of their bodies, which affects their center of gravity. You probably already make your kids wear helmets while they ride their bikes. Start asking your kids to wear their bike helmets whenever they go sledding. · Sled in designated areas. Hills in parks that aren’t designed for sledding can have trees or hidden rocks that can cause serious accidents for kids sledding downhill. Also, kids should never sled on a snowy street even if you live in a low-traffic area. · Mind the runouts. Make sure to have your kids move out of the runouts at the bottom of the hill to prevent any possible collision with other kids barreling down the slope. · Use common sense. 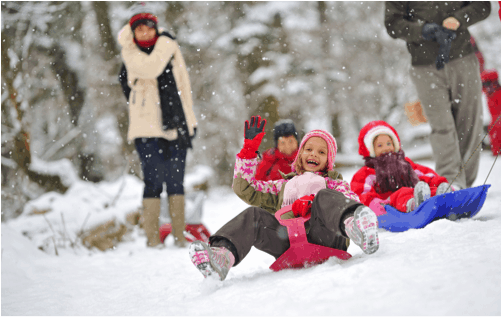 Avoid letting kids run with their sleds and belly flop onto them so that they’re headed downhill headfirst. Instead, have your kids sit on their sleds facing forward, and give them a push to start them downhill. Also, avoid sledding on anything that could be pierced, like a piece of plastic sheeting or a flimsy tarp. If you’ve ever seen “A Christmas Story,” you’ll remember the iconic scene in which Ralphie’s friend, Flick, licks the frozen flagpole on a triple dog dare. Flick’s tongue gets stuck to the flagpole, and the kids leave him outside until the fire department comes to rescue him. Flick’s a fictional character, but it’s a familiar story. Kids and teens sometimes take foolish risks related to cold weather dares. 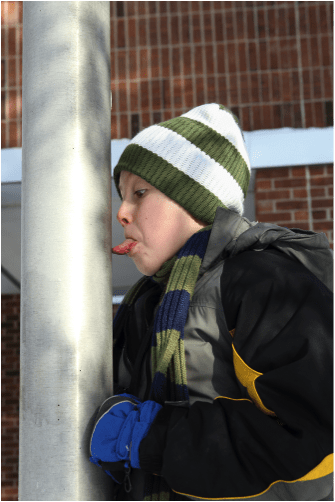 Fortunately, you don’t need to call the fire department if your kid licks the flagpole. Just pour warm water where the tongue meets the metal pole, and the tongue will be free of the metal. A much scarier cold weather dare involves a fad called the Salt and Ice Challenge. Kids hold either ice or the salt used to melt snow against their skin until they can no longer stand the pain. The dare can lead to frostbite or, with salt, severe burns and scarring. Make your kids aware of the risk, and don’t assume that your kids won’t be susceptible to peer pressure. Snow safety requires vigilance, a few precautions, and basic common sense. 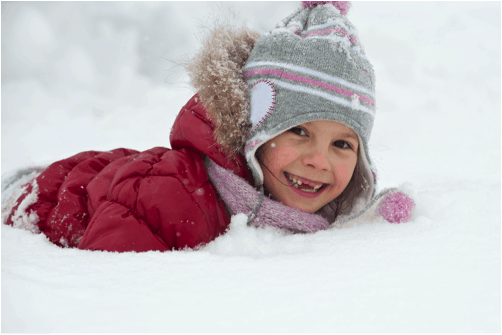 Your kids shouldn’t be cooped inside all winter, but make sure they play safely in the snow.